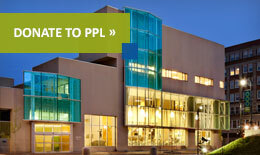 The Portland Public Library is a 501(c)3 nonprofit institution originally created in 1867 through both private philanthropy and city government funding, a tradition of support that it maintains today. Approximately 82% of our annual operating budget comes from city, county, and state government sources which funds the infrastructure costs of our facilities and personnel. The remaining 18% of the budget comes from the Annual Campaign, restricted operational gifts and grants, fees, and income from the Library’s endowment. These funds are what allow us to offer the programs, collections, and outreach that ensure the Library is truly a civic and cultural center for the region. For more information about the library’s financial operations, please contact the Administration office at (207) 871-1700, ext. 756.